What Are Leadership PACs And Why Are They Becoming Bigger Players In Michigan Politics? What Are Leadership PACs And Why Are They Becoming Bigger Players In Michigan? LANSING — Forty-one brand new Michigan House members took the oath of office on Jan. 11, 2017. By the end of April 2017, five of them had already launched a leadership PAC, a fundraising tool that allows elected officials to raise unlimited contributions from donors to support themselves and other candidates. By the end of their first year in the House, 15 of the new members — one in every three — had a leadership PAC, according to campaign finance records and fundraising invitations sent to potential donors. Of those 15, only six had sponsored a bill that became law by the end their first year. The numbers point to a larger phenomenon: Leadership PACs are becoming a more powerful player in Michigan politics. The trend gives donors the ability to make unlimited contributions to a wider array of elected officials and gives lawmakers who can attract donors the ability to wield more influence. Every state lawmaker has a candidate committee that they use to fund their own campaigns. There are limits on how much a donor can give to a candidate committee. For someone running for the state House, an individual can give up to $1,000, and a political action committee or PAC can give $10,000. The limits are doubled for Senate candidates. Candidate committees generally can’t give money to another candidate, except to buy a $100 fundraiser ticket. However, lawmakers who want to help their colleagues can set up their own PACs, known as “leadership PACs.” Through this tool, lawmakers effectively act as their own interest groups, raising un-capped contributions from donors and channeling the money to campaigns. These groups are different from Super PACs, which can take unlimited contributions but can’t give money directly to candidates’ campaigns. Super PACs can also accept corporate money, which traditional PACs can’t accept. In the 1990s and early 2000s, only a select number of lawmakers had leadership PACs, according to lawmakers who served in leadership positions at the time. The lawmakers with leadership PACs tended to be those who were serious candidates for a high-ranking position, like House speaker or House minority leader. Now, the majority of state lawmakers, about 62 percent, have a leadership PAC, according to the Michigan Campaign Finance Network’s tracking. A handful of lawmakers have multiple leadership PACs. 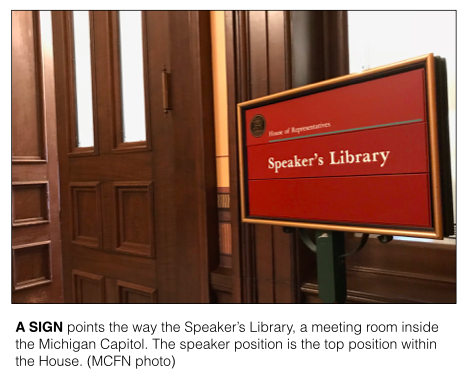 And with names like Michigan Strategic Leadership Fund and Blue Water Liberty Fund, it’s not always easy for members of the public to figure out if their representative raises money through a PAC. Not only do more lawmakers have leadership PACs, but the PACs are raising more money than they used to. During 2017, the 10 most active leadership PACs connected to state lawmakers combined to raise $1.9 million, which appears to be a record for a non-election year. 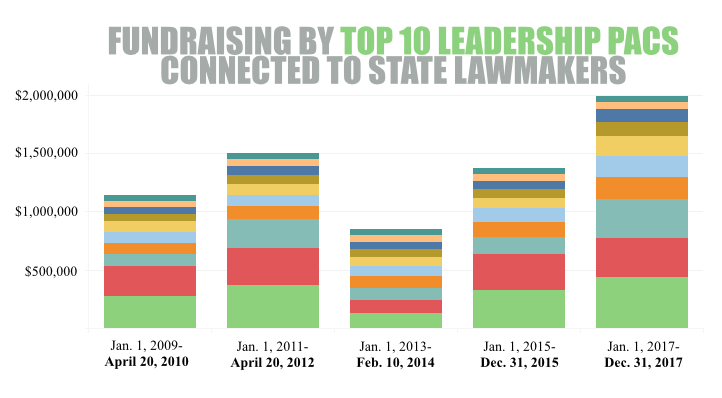 In 2015, another year without a statewide election, the 10 most active leadership PACs connected to lawmakers raised only $1.3 million. Over a similar but longer period from Jan. 1, 2013, to Feb. 20, 2014, the 10 most active leadership PACs raised $852,856, less than half of what they raised in 2017. Further back, from Jan. 1, 2009 to April 20, 2010 — more than three months of extra time — the 10 most active leadership PACs raised $1.1 million. Why Do Lawmakers Start Leadership PACs? Lawmakers launch their own PACs for a variety of reasons. Some start them because they want to be the next House speaker or the next Senate majority leader, the top positions in the Legislature. The people who fill those positions effectively control the agenda. By raising money and contributing to other lawmakers’ campaigns, the leadership hopefuls believe they will establish goodwill among colleagues who will eventually vote on the leadership positions. Other lawmakers want to use their influence to help their side win seats in the House or the Senate. Yet, there are others who want to help get like-minded candidates elected. MCFN reached out to the treasurers of five leadership PACs connected to first-term lawmakers launched by the end of April 2017. Only one person connected to the PACs responded. That was Rep. Yousef Rabhi, a Democrat from Ann Arbor, whose Liberty and Justice for All PAC formed on April 28, 2017. Rabhi said the sentiment in Lansing is that people who are interested in running for leadership positions need to start leadership PACs. The implied reality is that if someone wants to run for leadership, the person needs money, he said. “We shouldn’t be picking our leaders based on who’s raising the most money,” Rabhi said. He added that another reason he started his PAC was to support progressive candidates. The Liberty and Justice for All PAC reported raising $5,675 in 2017, and Rabhi noted that he hasn’t been raising the amounts of money that others have for their PACs. 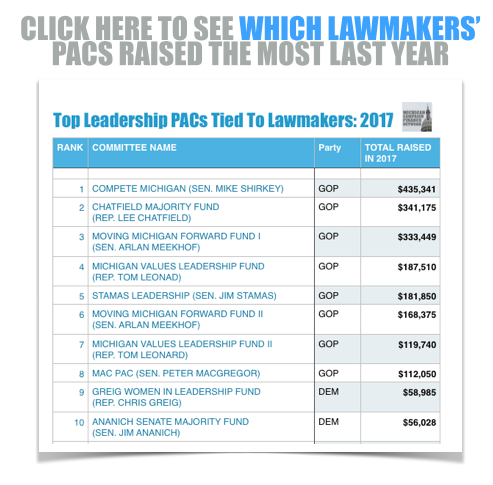 Other first-term lawmakers who launched leadership PACs early on were Rep. Brian Elder, a Democrat from Bay City, whose connected PAC, The Elder Fund, formed in September 2016, before he took office, and Rep. Thomas Albert, a Republican from Lowell, whose connected PAC, Conservative Leaders for Michigan, started in February 2017. 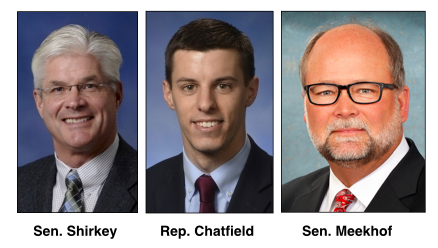 Michigan Strategic Leadership Fund, a PAC connected to Rep. Jim Lilly, a Republican from Park Township, and Michele for Michigan, which is connected to Rep. Michele Hoitenga, a Republican from Manton, started in March 2017. Perricone, who was the Republican speaker of the House from 1999-2000, said lawmakers who want to run for a leadership position one day usually start off by forming a leadership PAC. He also said that there are certain donors from whom individual lawmakers are best able to maximize contributions. Lawmakers then focus the money they raise on competitive races that decide which party wins a majority. Sometimes, the PACs give money directly to the candidates. Other times, they give money to the a caucus committee, which then channels the money to competitive races. As an example, the maximum contribution a PAC can give a caucus committee in a year is $40,000. In 2017, three different PACs connected to Senate Majority Leader Arlan Meekhof, a Republican from West Olive, each gave maximum contributions of $40,000 to the Senate Republican Campaign Committee, which will work to defend the Senate GOP’s majority this year. Perricone said lawmakers’ views on leadership PACs have changed over the years. It used to be frowned upon if a lawmaker’s PAC got too large because colleagues saw it as steering money away from the caucus, he said. But with much of the fundraising still going to benefit the caucuses, the feeling is not necessarily the same today. As Perricone said, the caucuses get to vote on their leaders so it’s up to the caucuses to decide whether to reward the fundraising or not. Likewise, former Senate Majority Leader Dan DeGrow, a Republican who served in the Legislature from 1981 until 2002, said the use of PACs was also more limited during his time in Lansing. Only lawmakers with legitimate shots at leadership positions started them, he said. And DeGrow, who is a member of the Michigan Campaign Finance Network board, said he doesn’t remember his PAC raising more than $150,000 in an election cycle. Leadership PACs are bringing in more than that in a year now. Three different leadership PACs raised more than $300,000 in 2017. Compete Michigan, connected to Sen. Mike Shirkey, a Republican from Clarklake, reported raising $435,341. Chatfield Majority Fund, connected to Rep. Lee Chatfield, a Republican from Levering, reported raising $341,175. And Moving Michigan Forward Fund I, connected to Meekhof, reported raising $333,449. As a comparison, between Jan. 1, 2009, and April 20, 2010, no leadership PAC connected to a lawmaker reported raising more than $300,000. As for what the money in leadership PACs could be used for, DeGrow said when he was in leadership he would put 45,000 miles a year on a car traveling around the state for meetings and other events. In addition to making contributions, current lawmakers have also used their PACs to pay consultants, to pay fundraising expenses and to pay for food for meetings. Of the $451,592 the top three leadership PACs reported spending in 2017, about 72 percent of the money was contributions to other committees. About 16 percent went to consultants, and about 4 percent paid for food and fundraising events. Who Are The Large Donors To Current Leadership PACs? Among the current crop of leadership PACs, there are multiple examples of individual contributions surpassing the $25,000 mark in 2017. Shirkey’s Compete Michigan, which raised $435,341 last year, received a $40,000 contribution from John Kennedy, CEO of Autocam, on July 20. Jon Cotton, the president of Meridian Health Plan, contributed $25,000 on April 19. The PAC also received five $10,000 contributions from members of West Michigan’s DeVos family. Chatfield’s Chatfield Majority Fund raised $341,175 in 2017. It received $30,000 from Cotton, $25,000 from members of the DeVos family and $20,000 from the Michigan Chamber of Commerce’s PAC. Meekhof’s Moving Michigan Forward I raised $333,449 in 2017. It received $15,000 from members of the DeVos family and $12,500 from Bruce John Essex, CEO of the Port City Group. Another Meekhof PAC, Moving Michigan Forward II received $50,000 from the Business Leaders for Michigan PAC on Feb. 27, 2017. The top leadership PAC connected to a Democratic lawmaker in 2017 was the Greig Women In Leadership Fund connected to Rep. Chris Greig, a Democrat from Farmington Hills. It raised $58,985 in 2017 with its top donor being the Comcast PAC, which gave $3,500, according to campaign finance records. A list of the top 25 leadership PACs in 2017 is available at this link. You can research which lawmakers have leadership PACs and who the top donors were through our donor-tracking page.